I have solved the issue of walking on the road, it is no longer possible. The simulation is still in color (for being pretty and hypnotic, but we only can only mutate and store gene1. There seems to be a discussion going on if the width of corridors matters or not. I found several papers that mentioned that it didn’t while Charles Ross found papers that said that it did. What we’ll end up with is either a yes or a no on if our model acts the way nature does (also depends on which idea we are following). If the answer is yes we can make some predictions of if several smaller corridors will work better (if width doesn’t matter it should). If the answer is no then we can work on figuring out why it does not act like nature and what we can do to model it better. The simulation is back to greyscale. The current version, greyscale_7, has 3 regions that are all attatched. Each region are attached to both of the others. The regions all have an identifying tag, 1 for the left region, 2 for top right, 3 for bottom right and 0 for the road and bridges. It starts with 4 circles, all in region 1. Each circle is given a unique id tag. We are recording id, parent, generation (parent’s generation +1), color, birthplace, death place, time of death, and list of regions it has been in. 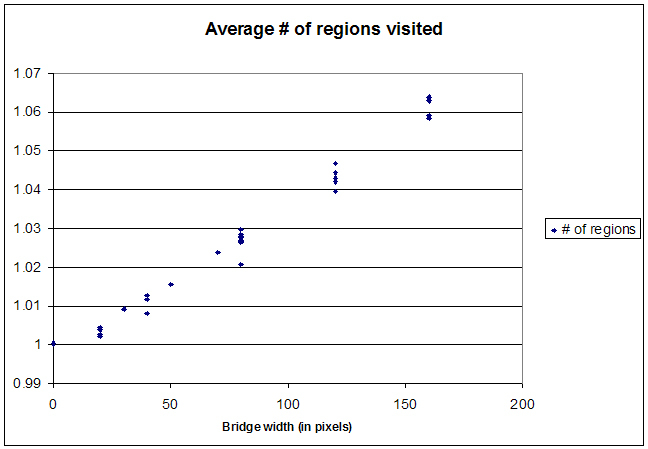 Since we are focusing on the width of the bridge we want to make several simulations with different widths of the bridge (One idea is how does several thinner bridges with a combined width x compare to one big bridge with width x). We can also change the shape of the bridge by making the road wider. A last thing to model is the patch bridge. Instead of a simple bridge like the ones we have in our current model we have several smaller patches that are not quite connected but together form a bridge.